Logan fishes all over the US—39 states and counting—with his goal to fish all 50, but this Michigan steelhead, fresh from Lake Michigan that he brought to hand, thrilled him, his Dad Dirk, and me to the max! Powerful, fast, and strong like so many of its kin, this fish truly tested Logan as it shot here, there, and everywhere. Just a gorgeous fall run steelhead! 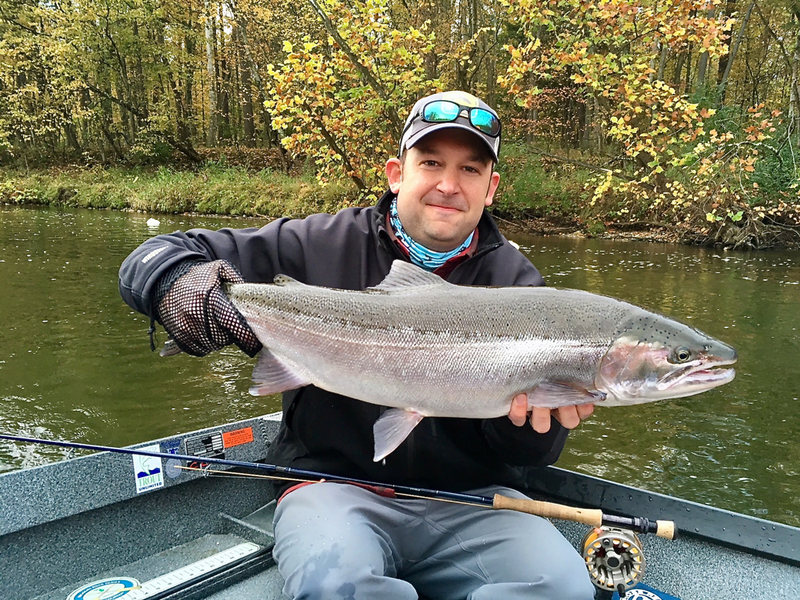 The size of some of our Muskegon River steelhead this year is terrific, and we’re off to a great start on them during this transition period in which Chinook salmon are still to be had (as Logan and Dirk attested today) as well as steelhead. In short, everything fly fishing one needs to make a most memorable day on the river. Congratulations, Logan!